Katie had a conference in Austin and I had customers, vendors, and investors to visit there so we coordinated our trip together. Of course I also took the opportunity to indulge in a little Texas BBQ while I was in town. North Carolina has excellent BBQ but it is pretty limited to whole hog pulled pork - and the ribs are pretty good too. However, when you see brisket on an NC BBQ menu, run the other way. It is often grayish and tough like pot roast and invariably lacks the spicy bark, smoke ring, and fall-apart-on-your-fork/melt-in-your-mouth-ness that I associate with the best beef BBQ in TX. 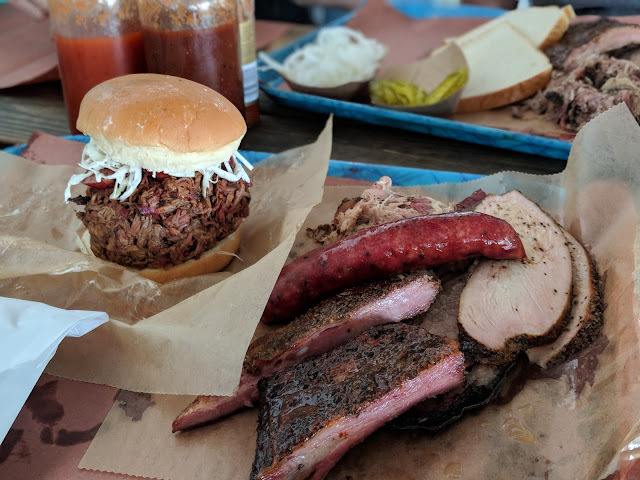 Texas BBQ itself is experiencing something of a renaissance. 10 years ago, if you wanted the best of the best, you had to make a pilgrimage out to small country towns. Then Franklin BBQ set up shop in Austin and the bar for craft BBQ inside the city limits of major metro areas was forever raised. Many others followed suit - not just in Austin but in other big TX cities as well. It's a great time to be alive if you love beef BBQ! I hit five BBQ joints in 48 hours and I had immense help from Packy Saunders in prioritizing/planning my tour. 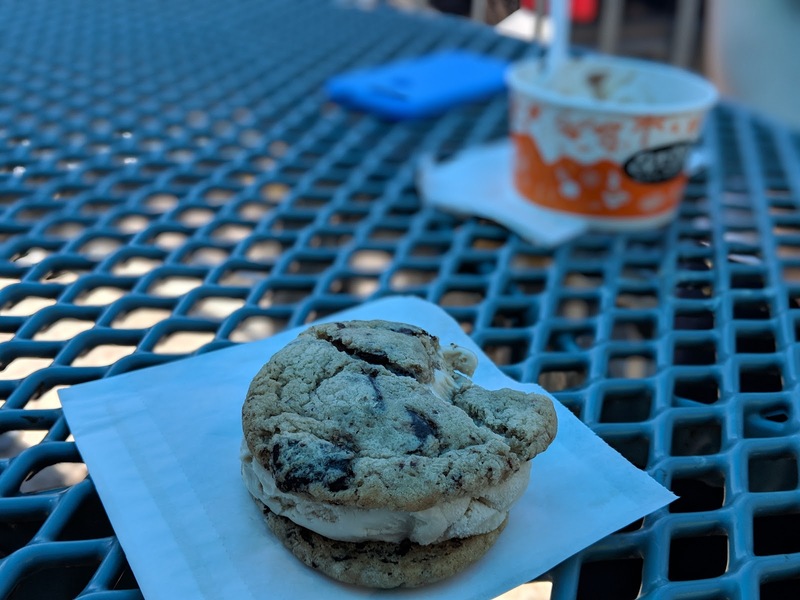 If you like food, you should be following Packy on Instagram. carrot cake whoopie pie (very good) - I think this was provided by I Knead That. Everything was a little saltier than it needed to be but the flavor was good. The hands down winner was the brisket frito pie, although the pulled lamb was a close second. By the time we left (~13:00), they were running out of the non-staples - so I'm glad we got the lamb when we did! After a short run along the lake to try to combat all the meat carnage, I headed to Terry Black's by myself. Combining the brisket with the mac n' cheese was a winner but the banana pudding was definitely the standout. 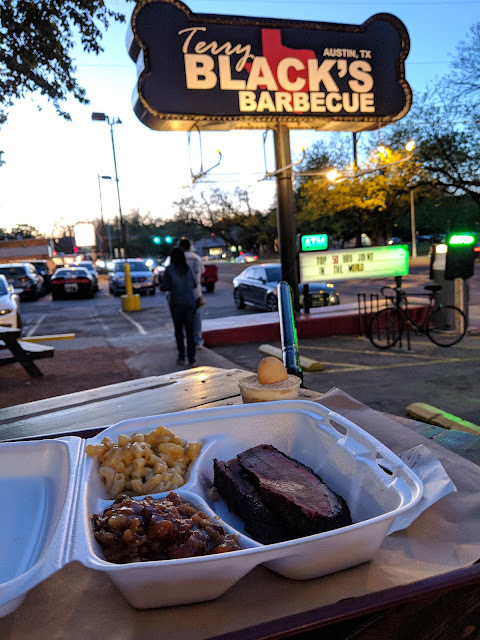 There was nothing exceptional about Terry Black's BBQ, but A. I was there near closing and B. I only tried the brisket so I will reserve judgment until I've had a chance to try more. The weather was unseasonably cool so I began the next day with a long run around the lake - just what I needed to make room for more BBQ! Valentina's is pretty far south (~20 minute drive) and is another food truck with shaded seating. ~10AM there was no line. 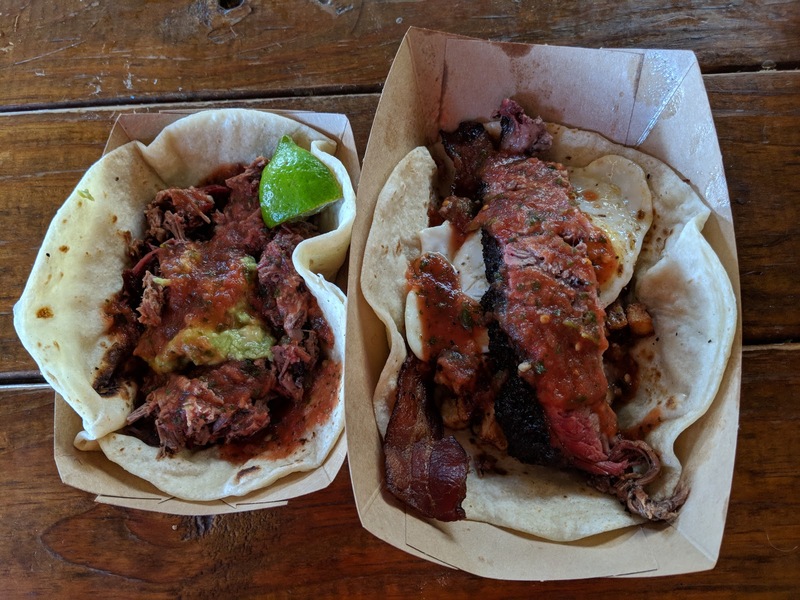 They had both BBQ and Tex Mex on the menu but my pro tip from Packy was to stick to the breakfast tacos. After a day of business meetings, I took another 20-minute drive south to this food truck. I arrived right at 5 PM (when their dinner menu opens up) and there was no line. With a pint of Yellow Rose from the next door bar, it was a hell of a way to unwind after a packed day. The menu here was less traditional but everything I had was very good. I love, love, LOVE that they make their BBQ sauce with beets. 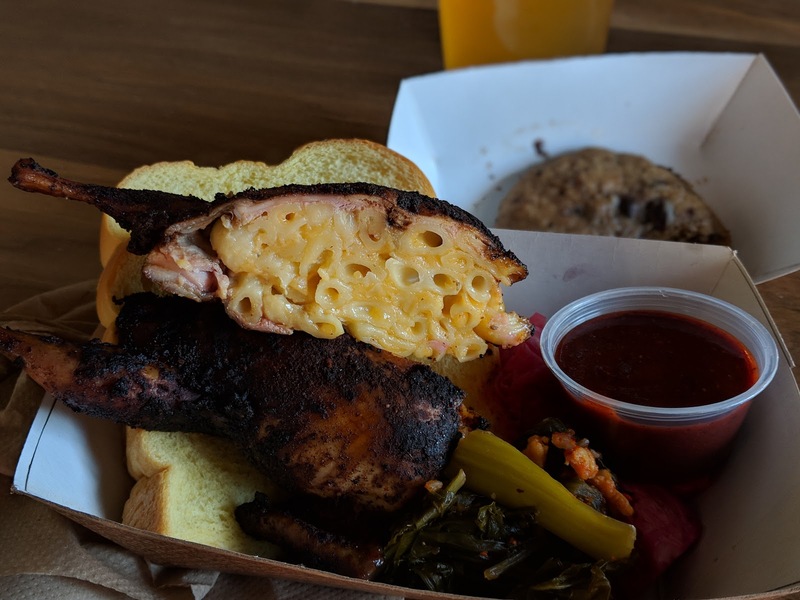 I don't blame the other BBQ joints for mass producing their sauces with bad ingredients like high-fructose corn syrup but I do strongly prefer this approach. After hearing about Franklin for years I finally decided to take the plunge. I woke up early, went for a preemptive strike run, and then arrived at Franklin around 8 AM. They offer chairs to the first 30 or so people in line, which made the wait much easier. They also very considerately came out and asked each of us for our intended orders so they could warn people farther back if they might run out of some meats. They opened their doors at 10:59 but, even at #15 in line, I didn't reach the counter to order until ~11:30. I didn't find any of Franklin's meats to be markedly better than those of the other top places in Austin. What makes Franklin special is really the experience. Sitting around with others "of your tribe" who are excited enough for good BBQ to devote an entire morning to it is something akin to tailgating. I made some fast friends in that line and the wait was over before I knew it. Franklin has the operation down to a science and they are very accommodating, opening up their bathrooms and selling beer long before their 11:00 open time. Noticing a pattern here? None of these are individual cuts of meat; they're all combos in which the whole is greater than the sum of the parts. I think the best Houston BBQ joints are on par with the best of Austin when it comes to individual cuts of meat (e.g. the beef rib at Killen's). 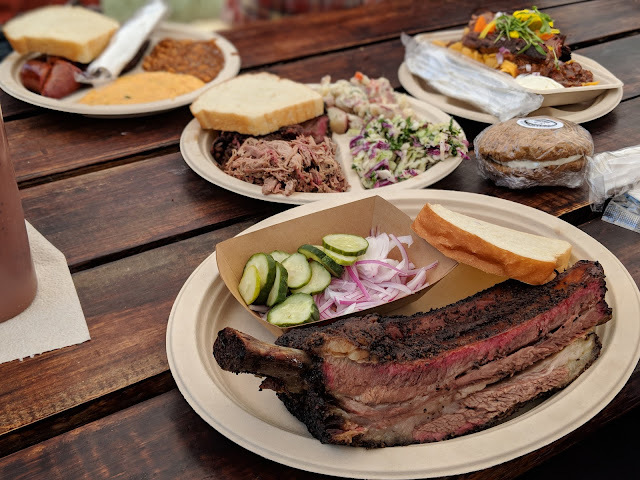 Austin BBQ is distinguishing itself at the moment through inventive flavor combinations and, as much as I love brisket, ribs, and sausage by themselves, these innovative combos are really refreshing.